Her golden hair drifts slowly out in waves to weave a web of sunlight through the room, luminous, when all else is blue and grey; her flower garland long since turned to silt. She who arrived flushed pink and ripe with youth has paled to milky pallor through the years. Her smile, which grew on lips once plump, has withered, and eyes afire with passion have been doused. Despite her deathly glow and vacant stare she is much loved within our river home; tenderly, quietly, I tend to her, combing her hair, untangling the weeds. I look up as I swim towards her body, and try to hear the songs she used to sing. Back when she floated on the river surface. Before the silence, when we dragged her down. They whispered 'mermaid' when they found her body, after a fretful moonlight river hunt. They'll never know she is now more than ever. She's lonely. She will talk to none but me, and even then she will not meet my gaze. She's always looking, always staring up. Up, up, up to the surface and her past. This is the only way she knows to be. “Can I go up now, sweetness?” she whispers, her only words in these four hundred years. She hasn't felt the passing of this time; immortally trapped, she still yearns for the sky. Perhaps she can recall snatches of song. Perhaps she recognises the willow, weeping ripples on the water's surface. Perhaps she has a sense of who she is. Was. The little sighs seem to give her away. I doubt she knows. I doubt it's real memory. Just a glimpse of something distant recalled, whenever someone else uses her name, retelling this most ancient tragedy. “One day, one day,” I croon, humouring her. Each time I lie her glow beams brighter still, but, faster than when she first arrived, dulls. It pains me, yet I love to hear her ask. But as she's here beyond the veil, with me, the best that I can do is fan the spark. I'll keep the glow alive and guard her name, until there comes a time the stories end. Then, and only then, will she be free, and her restless spirit finally can fade. Good night my lady, good night, sweet lady. 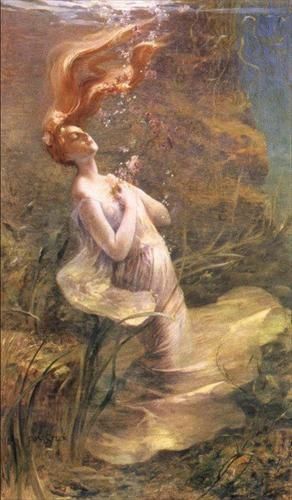 Ophelia.